Oklahoma City • When the Jazz played the Thunder for the first time this season on Dec. 10, their inability to handle OKC’s pressure defense led to a rash of early turnovers and a not-that-close 122-113 loss. 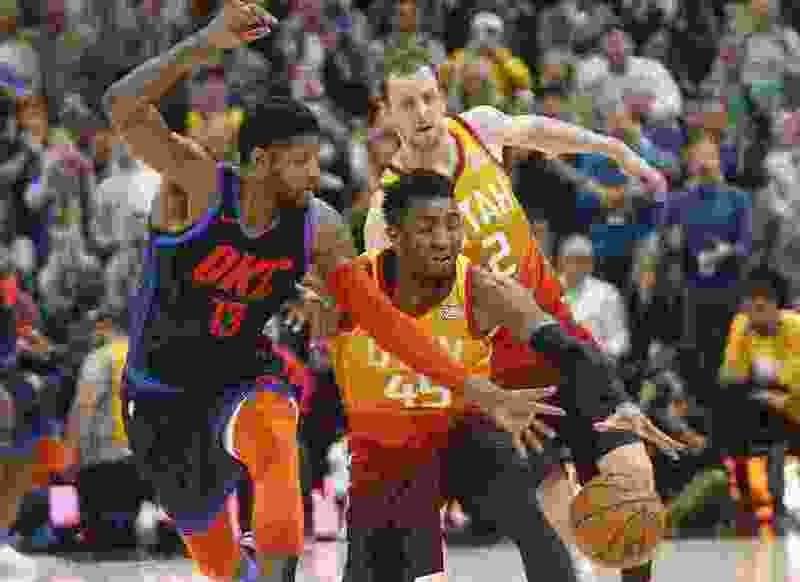 When the teams met again less than two weeks later, on Dec. 22, the Jazz’s inability to diffuse a Paul George offensive explosion resulted in yet another defeat, albeit this time by only a 107-106 margin. So it’s safe to say that, when the Northwest Division rivals meet up for the third of four matchups this season on Friday at Chesapeake Energy Arena, the Jazz know all too well that — going against a team featuring a Most Valuable Player candidate and a point guard on a historic run of triple-doubles — nothing is going to come easy. Indeed, the Thunder’s .649 winning percentage is sixth-best in the NBA, and after winning eight of its past 10 games, the team has firmly established itself in the top tier of the Western Conference. Oklahoma City is four games behind first-place Golden State, two games behind second-place Denver, and three games ahead of fourth-place Portland. A big reason for it all is the impressive ascension of Paul George. After spurning free agency last summer to re-sign with the Thunder, George has taken his game to another level this season. He is second in the league in points per game, at 28.7, and is first in steals, with 2.3. The eighth-year forward out of Fresno State is also averaging 8.0 rebounds and 4.1 assists per game. He’s also third in the NBA with 218 total 3-pointers made, and he is converting his deep attempts 40.6 percent of the time. Utah has experienced it firsthand. In the teams’ previous meeting, George hit a series of increasingly improbable shots en route to a 22-point third quarter that helped swing a 79-70 Jazz lead to a 93-81 Thunder advantage. He would finish with a mind-boggling stat line of 43 points, 14 rebounds, six assists, and five steals. Needless to say, George has been so transcendent this season, he’s reduced Russell Westbrook — a former league MVP merely averaging a triple-double for a third consecutive season — to secondary status on the team. Westbrook is averaging 21.7 points, 11.2 rebounds, and a league-leading 11.2 assists per game. He’s also second in the NBA (behind only George) with 2.2 steals. And the point guard has muscled his way back into the headlines by setting a new NBA record with a triple-double in 11 straight games — with a chance to get No. 12 on Friday. And in spite all of that, Snyder said the UCLA product’s best attribute may be his leadership. “The way that Russell is connecting the entire group, he keeps them at such a high level competitively that it’s allowed their other players to continue to improve,” said Snyder. While much of the focus on the Thunder this year has been their high-flying offense — their 115.4 ppg rank fifth in the NBA, after all — the team has taken the next step because of its improvement on the other end. OKC leads the league with 10.2 steals per game. And its 105.2 defensive rating is the NBA’s third-best. In their first meeting vs. the Jazz this season, the Thunder forced 19 turnovers in the game’s first three quarters. Gobert, for one, is especially eager to see what the Jazz can do this time around. Nothing will surprise him, though. About the Jazz • Their last game before the All-Star break was a 115-108 loss to the Warriors in Oakland on Feb. 12. … Donovan Mitchell ranks 17th in the NBA with 22.4 ppg. Rudy Gobert ranks first in FG% (65.4), third in blocks (2.1), and fifth in rebounds (12.9). About the Thunder • Point guard Russell Westbrook has recorded a triple-double in an NBA-record 11 consecutive games. He has 24 total this season. … Forward Markieff Morris joined the team after he was traded from the Wizards to the Pelicans, and subsequently released. He is averaging 11.5 points and 5.1 rebounds per game this season. Real Salt Lake’s starting lineup has changed almost every game. But in last two wins, the back line hasn’t.